This puttu made with rice, wheat, ragi , and so on..Kerala Puttu is dish of rice flour layered with freshly grated coconut & slice of Nendran Banana and steamed in a piece of bamboo. Nendran Bananas are rich source of potassium and fiber. This Banana fruit sugar is balanced with fiber, it helps to maintain glucose level. If you do not have one, you should seriously consider buying one, this is useful for making lot of other recipes too. just like bamboo biryani , steamed banana & so on. Add little bit water and keep mixing the flour and salt. add water if necessary. We need bread crumb consistency. Do not add too much water. just check for its consistency in between. Adding too much water will spoil the puttu. 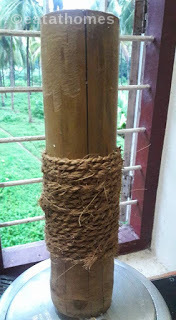 In the puttu maker (known as the puttu kutty), `take the bottom round mould (kudam), pour water almost half of that and place it on the stove top. Now take the top part of the puttu kutty. Place the round, perforated disc that comes with the puttu kutty at its bottom. Add one layer (about 2 tbsp) of Fresh grated coconut. Add about 6 tbsp of semolina flour, which we have already prepared. While filling the flour, do not press with spoon or hand, let it be loose. Again put one tbsp of grated coconut followed by another 6 tbsp of prepared puttu flour. If your puttu kutty is big, you may have to add a 3rd layer. Finally top it with one tbsp of grated coconut as the final layer. Close it with the lid and place it over the bottom round kudam of puttu maker which has boiling water. Wait for few minutes, for the steam to come out of the top holes in the lid. Allow few minutes (about 3-5 minutes), for the steam to come properly and then switch off the stove. Carefully remove the putty kutty from the puttu kudam. Keep a plate ready and using a long spoon, apply pressure on the bottom hole of puttu kutty and the puttu comes out easily. 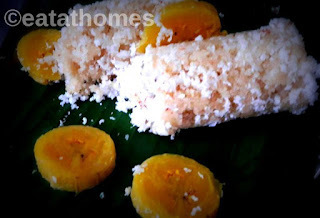 This puttu can be enjoyed with banana and sugar. In Tamil Nadu, when puttu is still warm it is taken in a bowl. Sugar, cardamom powder, ghee and some toasted cashews are mixed with the puttu. This makes the puttu very aromatic. It is then eaten as such or served with sweetened coconut milk. Whatever you serve with, have a cup of black tea or Masala tea/chai along to make it more authentic.